Disney returns to the lovable Wreck-It Ralph universe with Ralph Breaks the Internet which is now available on Digital, 4K Ultra HD and Blu-ray. The film features John C. Reilly returning as everyone’s favorite video game star, Wreck-It Ralph along with Sarah Silverman as Vanellope. In this charming new film, the two discover and explore the wonders and mystery of the world wide web! The pair soars through cyberspace to learn all about what the internet has to offer. The film also features the voice talents of Gal Gadot (Shank), Taraji P. Henson (Yesss), Jack McBrayer (Fix-It Felix, Jr.), Jane Lynch (Calhoun), and Alan Tudyk (Knowsmore). 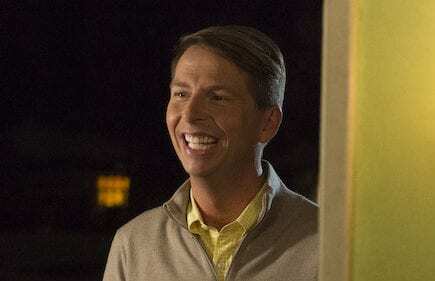 We recently had the pleasure of speaking with Jack McBrayer about the new film, and all the incredible bonus features which the home release has to offer. Check out our full interview below. 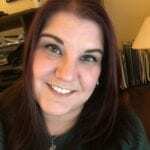 Denise Caputo: Congratulations on the success of Wreck-It Ralph and Ralph Breaks the Internet. Both films are awesome. I had a film night with my nephews the other weekend. They’re 9 and 12-years-old, and we watched Ralph Breaks the Internet. We all loved it. I love that there’s something for kids and for adults as well. It’s a beautiful film. Congratulations. DC: You’re welcome. And of course, your character is back in the new film, Fix-It Felix Jr., and we get to see where he is with Calhoun now, six years and 15 children later, in their very unlikely marriage. 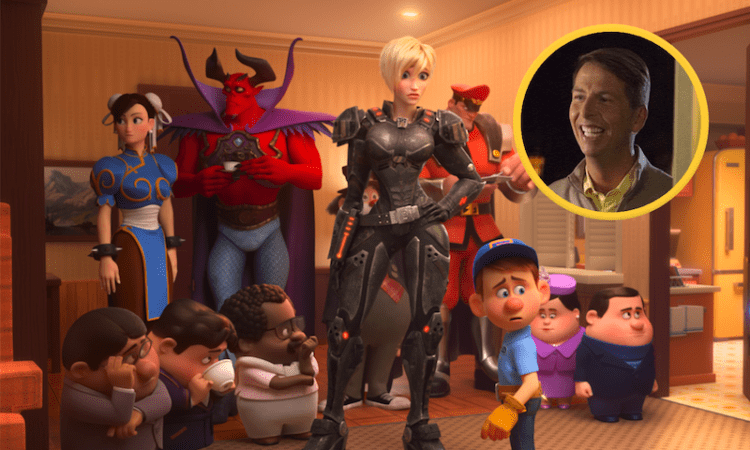 Tell me a little bit about where your character is now in Ralph Breaks the Internet versus where we left him in Wreck-It Ralph. JM: Sure! So, six years have passed since the first film. Felix is still happily married to Calhoun, but due to circumstances, they have found themselves in a situation where Felix and Calhoun have to take in 15 children, which would upend anyone’s world. What I love about Felix is he’s just got this almost single-minded directive of, “I can solve this. I can fix this.” He’s always in it to help and set things right. Sometimes a problem is bigger than just having the desire to make things right. So, it was fun to play that. It was fun to see Felix in a situation where he was just overwhelmed, and he needed more help than he was used to having to ask for. DC: Definitely. 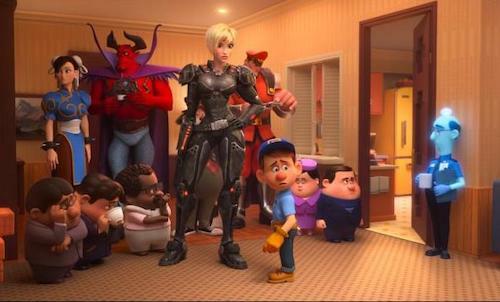 How did it feel back being back in the Wreck-It Ralph world and voicing that character once again? JM: Oh, piece of cake. Piece of cake. The writers established everything so well from the first film that it was like easing into a comfy pair of slippers for the second one. Not to mention my scenes were with John C. Reilly and Jane Lynch, so I was able to actually be in the booth with them for a couple of sessions. It was just a delight. Those guys, they make me laugh like nobody else. It’s so fun. There were times that we’d look at each other and say, “This is our job?” It was just a wonderful experience. DC: You answered part of my next question. I know with voice acting, often you’re by yourself in the recording booth, so that must have been awesome, to record with the other actors. You can bounce things off of each other. You can maybe improv a little bit as well. Did you improv and did any of that make it into the final cut of the film? JM: You can! It makes it so much special. I know that some of the improv did make it. What I mostly remember is ruining takes because we’d get the giggles, but it’s because those guys are liquid funny. I remember doing a run with John C. Reilly of me mispronouncing eBay, and it lasted for a full four minutes. Like, “E-boo. E-boy. E-buy.” It stopped being a word. It stopped making sense. We were losing our minds! Honestly, that’s one of my favorite memories. That’s going be one of my takeaways of recording Ralph Breaks the Internet which I would not trade for the world. DC: So, how does that recording process work? Is there a rough edit of the animation done already, and you work off of that or is the animation created based off of your voice and the way that you present the character? How does that work? JM: Kind of the second. We will lay down our voices first. The animators can then draw off of that, but they’re also videotaping us while we’re doing that. JM: Yes, and in a strange way, some of our characters do resemble us in some aspects. JM: It’s fun to see what they captured. I can totally see Jane Lynch moving her hand like this in this one scene. Things like that are true to the actor, but they may work for the character as well. So yes, we do voice stuff first, and also they’re still making changes to the script. It takes a great deal of time to record and to get an animated film made. So, you go back in several times over a period of gosh, even a couple of years. Thankfully, I did not hit puberty during any of that time, but it does take a while. Then, there are some times where you will have to come back in once the animation has been created if they need to tweak something or add a line or just if something got changed in editing. DC: Awesome. So, of course, everybody loves you from your role of Kenneth Parcell on 30 Rock. Awesome character, fantastic show, but I’d imagine it’s quite a different experience when it comes to filming versus recording. How did your involvement with a film such as Ralph Breaks the Internet compare to being on a show like 30 Rock? JM: Thank you! In a general sense, doing voice acting, I was flexing a different muscle than I was doing live-action. I would come into the booth, especially when I was first starting to do voice acting, and I’d be moving my arms all around and jumping up and down and all this stuff. The director would be like, “Okay. Let’s do it again. You can settle down a little bit.” Whereas when you’re acting in a live scene, you have to be doing all that stuff. What I’ve loved about the voice gigs that I’ve had is, and this makes it sound like I’m being a little lazy, I’m able to utilize my own voice. What you’re hearing right now is pretty much most of the characters that I’ve voiced. I kind of love that, because to me it’s like, “Okay. This is the type of character we’re going for with this one, with the script.” I know exactly what I can do with that. Not to say you don’t want to challenge yourself or try new things or anything like that, but at the same time, I’m like, “Oh I got this. I got this. Let’s see what we can do together.” Also, I love doing stuff for kids. I love it when kids recognize my voice. Like, “Hey Fix-It Felix is also the Pirate Mummy from Jake and the Neverland Pirates!” It’s so fun for me! It’s fun for me to listen to my friends who have kids talk about it. DC: Very cool. So, recording the film is one thing. Then finally seeing the finished product and how it all comes together with the animation, that’s an entirely different ballpark. This film is also beautifully done in addition to having the stellar cast like yourself, John C. Reilly, Sarah Silverman, Jane Lynch and all the rest voicing such wonderful characters. How did you react when you first saw the final finished product of the film? JM: It blows me away every time. The first film, it did. The second film, it did. It also reminds me of how many people contributed to this film and how many people worked so hard and spent so much time and energy on a project like this. It’s quite humbling. It really is, because yeah I have a recognizable voice in it, but I guarantee you there are hundreds of people who work 20 times harder than me and their work is more valuable than anything I contributed. It’s so amazing to see the finished project, but then when you watch the credits at the end, you’re like, “I want to find each of these individuals and shake their hands,” because it’s so many people who work so hard. It really does just put things in perspective for you. DC: That’s so awesome, and the home release of the film on Digital and Blu-ray format digs a little bit into the work those people did behind-the-scenes footage and deleted scenes. There’s a whole ton of extra content on the home releases, which will help show audiences a little bit of that. JM: I know! Hopefully, because they deserve all the credit they can get. DC: They certainly do! So, since the films are video game-centric, if you could live inside any video game, past or present, which game would you choose and why? JM: Oh boy. You know, I like Grand Theft Auto because of the reality of it, but I don’t like the violence. Is there a version of Grand Theft Auto where you can just go to different beaches in Hawaii, and just enjoy a fruity cocktail on crystal blue shores? Until that video game exists, I guess I’ll just say Burger Time. DC: Is there anything else that you want our readers to know about Ralph Breaks the Internet or do you have any upcoming projects that you’d like to share with our readers? JM: Well, a little bit of both. One, if they happen to be in London anytime between now and the end of June, I am making my West End debut in the play Waitress, which I’m really excited about! One takeaway I’d like to share from Ralph Breaks the Internet – As proud as I am of the movie, as much as I love how well received it is, one thing that I just value as a human being is face-to-face contact and human connection. So, yes technology is a huge part of all of our lives right now, but I think, at the end of the day, we are all human beings, and we need to connect with each other as human beings. So, just maybe make a concerted effort to call someone or go visit someone and enjoy that kind of connection too. Thanks again to Jack McBrayer for taking the time to speak with us! 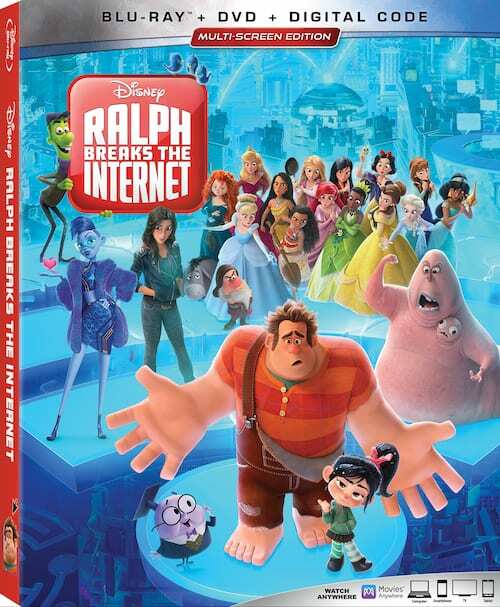 Ralph Breaks the Internet is out now on Digital, 4K Ultra HD and Blu-ray. Pick up your copy today! This post is not sponsored, but we may receive a portion of sales if you purchase any of these items. Thank you for being a valued reader of Fan Fest News!